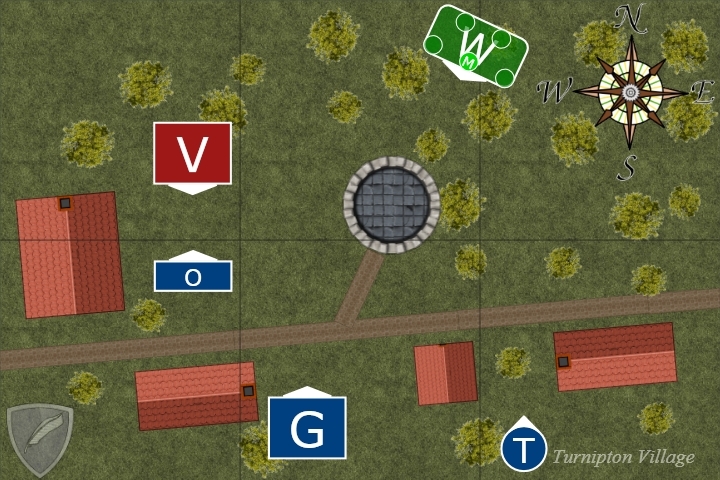 This battle report is from a very simple game scenario, which hopefully will still show off what Battle Chronicler is capable of. 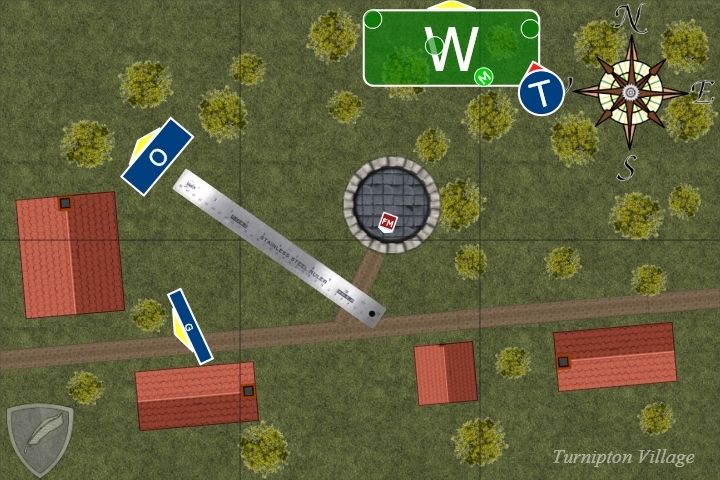 Turnipton is a small village on the edge of civilised lands. A powerful wizard has taken up residence in the village, but can the villagers rely on his help, when a goblin raiding party chances upon them. The game was played on a 3 foot by 2 table. 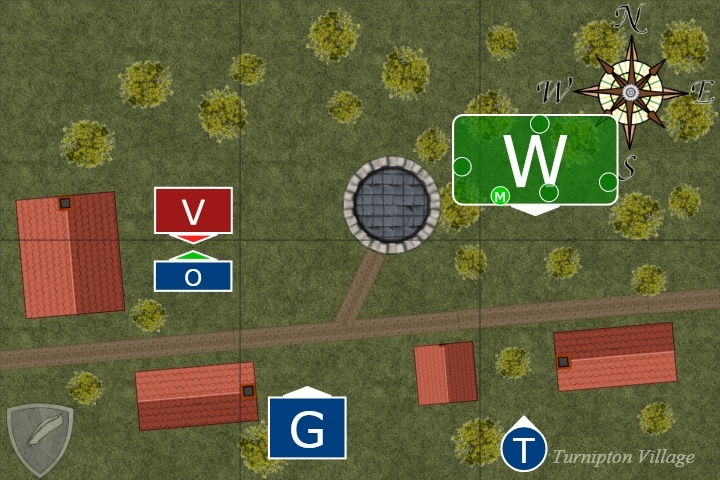 A special rule states the Wizard can only be deployed on a dice roll of 4+ at the start of Turnipton's turn. 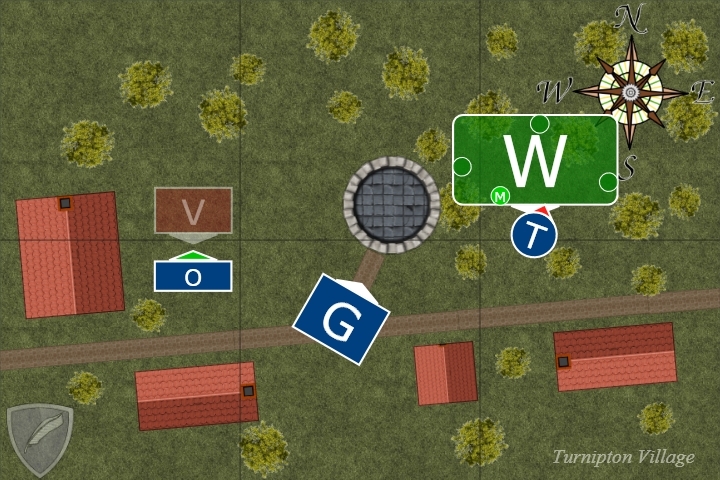 The Turnipton general placed his Villagers in the north west. The Wizard cannot be deployed until later. The Goblin general deploys his units in the south half of the table. The Turnipton general rolls a dice to see if the Wizard has completed his studies and can join the battle. He rolled a 2 so stays in his library. The villagers encouraged by their superior numbers charged the orcs. However despite killing two orces they sufferied six losses of their own. The Back Woodsmen cautiously advanced through the trees. Here is a close up of the action showing the individual models in each unit. The Mayor and the Orc Boss have their own colors and labels. 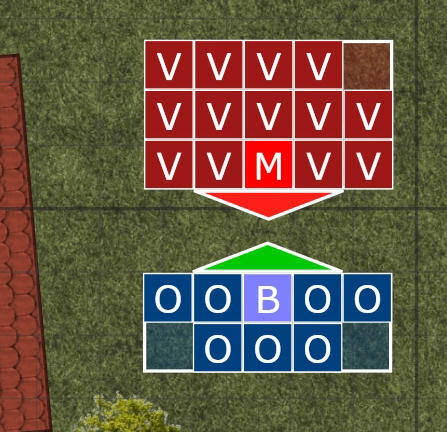 The orcs strike back at the villagers wiping the rest of them out. The goblins approached the front of the tower. The Troll spotted the Back Woodsmen and immediately charged into them, grabbing one and started to eat. 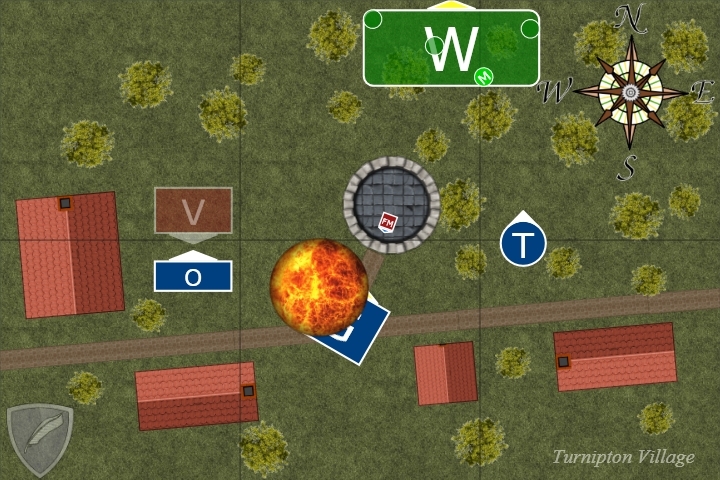 This close up shows the Back Woodsmen as individual models without their unit boundary. They are in loose formation so each model can be positioned independently of the rest. A roll of 5 meant the Wizard had finally decided to make an appearance. Wasting no time the Wizard cast a three inch fireball from the roof of the tower right into the middle of the goblins below. The remnants of the goblin unit then started to flee away from the tower. Confronted with a berserk troll the Back Woodsmen ran for their lives into the forrest. Seeing the fate of their smaller cousins quickly broke the morale of the orcs who then joined the flight to the woods. The Report (c) Tom Wright 2009. All rights reserved. The Report by Tom Wright is licensed under a Creative Commons Attribution-Non-Commercial-Share Alike 3.0 Unported License. Component (c) Tom Wright 2009. All rights reserved.